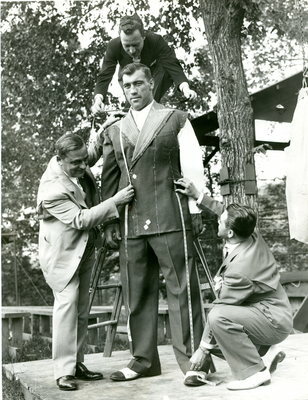 A black and white photograph of boxer Primo Carnera being measured during the fitting of a suit. Stamped on the reverse to say, "Note to Editors: May 29, 1934. Under each reproduction of this picture must be carried the following credit: 'ASSOCIATED PRESS PHOTO.' This picture may not be syndicated, rented or leased nor used for advertising purposes. The Associated Press." An additional handwritten note on the back reads, "Carnera, Billy [Lambs? Taubs? ], left." Rights assessment remains the responsibility of the researcher. Stamped with stipulations for use by the Associated Press in 1934, as noted in the description. For information about the process and fees for obtaining higher resolution scans or another file format, contact Special Collections.